Irish Newspaper Archives records start in 1738 and contain regional and daily newspapers therefore offering millions of pages ripe with anecdotes to family heritage. With over 60 newspapers titles available researchers will have the ability to tie down ancestor’s location and time to a county and have access to the regional paper from that location. This is only possible through Irish Newspaper Archives as we offer the largest online database of Irish Newspaper in the world. While newspapers offer a treasure of information it is important to note that unlike census records and government produced records their accuracy maybe in question. This should be kept in mind when searching and retrieving information. Newspapers offer the ability to form a big picture overview of a family grouping. Information can be gleamed through the regional and daily obituaries and through the local stories and possible court appearances. There are many resource around the world that can be usefully when conducting research. Follow this link a handy resource for international research. Start your genealogy research today !! 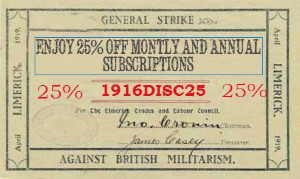 I recommend using our 25% discount code to avail of a year’s membership to Irish Newspaper Archives.